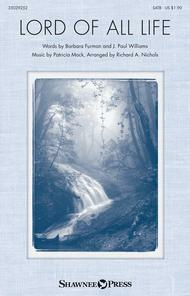 Composed by Barbara Furman, J. Paul Williams, and Patricia Mock. Arranged by Richard A. Nichols. Shawnee Sacred. Sacred. Octavo. 8 pages. Published by Shawnee Press (HL.35029252). A simple, yet elegant sentiment is conveyed by this meaningful text set to artful music! The divine attributes of the Savior are chained together with a winding melody that invites the singer to personal worship and adoration. A supportive piano part sets a faithful pacing and brings a reverent spirit to the piece. A final layering of the vocal lines offers a calming and engaging conclusion.